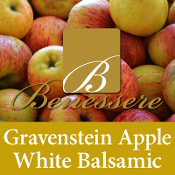 The Gravenstein Apple is a hard to find varietal due to the difficulty farmers have cultivating it. In California, it's highly prized for its heady ambrosia perfume and crisp, sweet-tart cream colored flesh. Our Gravenstein Apple White Balsamic marries the complexity of the Gravenstein's larger than life flavor with our well-balanced Ultra Premium White Balsamic Vinegar from Italy. It positively shines when paired with our Persian Lime, Blood Orange, Tuscan Herb, Herbs de Provence and Gremolata Olive Oils. Create marinades, dressings, and bread dippers by blending with oils or enjoy simply drizzled over fresh cut melons or berries.